When I shared several gift ideas in my Gifts of Good Taste post for our Gluten-Free Holiday event, I mentioned that my husband’s late aunt and uncle only really wanted my snack mix each year for Christmas. It’s not a traditional one, but it’s outstanding. Snack mixes are usually spicy and salty, but this one shown above is a mixture of sweet and salty, plus crunchy, of course (all good snack mixes should be crunchy!). Think of a lovely light-tasting snack mix, but with chunks of caramelized goodness alternating with salty bites. This snack mix has long been a family favorite for holidays and is much enjoyed by friends at our occasional parties as well. In the interest of full disclosure (it’s always WYSIWYG here at gfe—i.e., What You See Is What You Get), I’ll remind you that I’ve gotten sick every time that I have eaten the “gluten-free” Chex cereals. Others report the same on gluten-free forums and blogs. It doesn’t seem there are a huge percentage of us who react to products that are less than 20 ppm gluten (any maybe all who react are not vocal on the subject, do not realize they are having a reaction, or doubt their reaction since they are eating a “gluten-free” product), but we exist just the same and those of us who are vocal all cite a gluten reaction. Yes, it’s a gluten reaction. It’s not the flu, it’s not another food issue, etc. I spoke about this reality before when I shared my trip to General Mills, aka Betty Crocker Central. I hope one day I can eat the Chex cereal safely, just so I can enjoy these snack mixes once or twice a year. 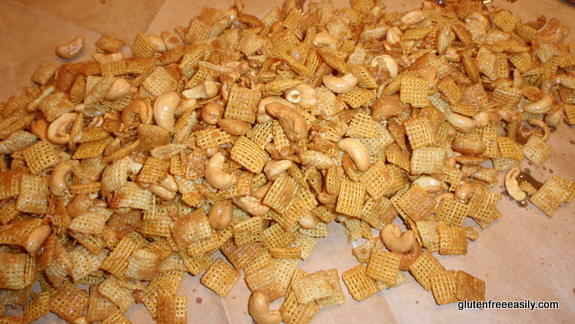 But, until then, I will still make snack mixes using Chex for those in my family who do not eat gluten free. If you’re eating “gluten-free” Chex and plan to continue to do so or don’t eat gluten free, then you’ll love these recipes. Cut butter into slices and place in large roasting pan. Place in oven for one minute until butter melts. Stir in brown sugar well. Add other ingredients individually, stirring well, but somewhat gently, after each addition. Bake for one hour, stirring well every 15 minutes. If you are not gluten free, you can actually use Crispix, but gluten-free readers, please know that Crispix is not gluten free because it contains barley in the form of malt flavoring. 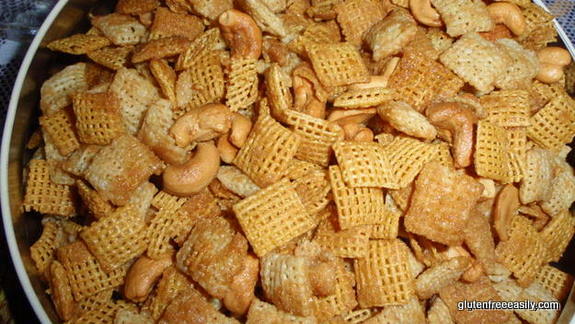 If you know of another square, crispy cereal that you can safely eat, you can substitute that for the Chex. I usually use Ener-G Foods small pretzel twists because they are just the right size, as well as nice and crunchy. I use one whole bag of their product. I open two brown paper grocery bags, inside surface exposed (one on top of the other), on the counter. I pour the mix onto the bags and spread out for cooling. This method also helps absorb excess butter. I haven’t yet tried it, but I think this mix could be wonderful if made with coconut oil instead of butter. I’m sure it would also work with non-dairy butter equivalents like Earth Balance. This recipe makes a lot so you’ll need to halve it if you don’t have a large roasting pan or similar baking pan to bake the snack mix in. I highly recommend that your baking pan have high sides.Adapted from Taste of Home magazine. Stir in seasoned salt and Worcestershire sauce. Add other ingredients individually, stirring well, but somewhat gently, after each addition. Bake for one hour, stirring well every 15 minutes. Adapted from General Mills Traditional Chex Party Mix, recipe circa 1980As noted in the Sweet and Crunchy Snack Mix recipe, I usually use Ener-G Foods small pretzel twists because they are just the right size as well as nice and crunchy. I use one whole bag of their product. I open two grocery bags, inside surface exposed (one on top of the other), on the counter. I pour mix onto the bags and spread out for cooling. This also helps absorb excess butter. I haven’t yet tried it, but I think this mix could be wonderful if made with coconut oil instead of butter. I’m sure it would work with non-dairy butter equivalents like Earth Balance. This recipe makes a lot so you’ll need to halve it if you don’t have a large roasting pan or similar baking pan to bake the snack mix in. I highly recommend that your baking pan have high sides.You can see from the photos that the containers that held the nuts (as well as other suitable containers, like large Frito “tins”) were used as my gift container. It’s easy to wipe them out well after they are used, store away until needed, then wrap them in wrapping paper (great way to use those small scraps), fill with snack mix, and then top with a label and bow. Glass jars and tins may also be used. 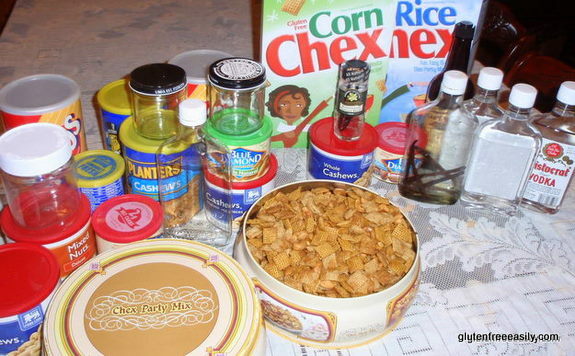 (However, the glass jars and bottles in this photo are ones that I used for Honey Butter and Homemade Vanilla Extract.) Children can definitely help with these activities. Don’t obsess over the gift packaging being "just so". Uncle Charlie will get a much bigger kick out of little Becky's wrapping efforts than he will out of the package that you wrapped so perfectly. Plus, the snack mix gets eaten pretty quickly and the container often gets tossed just as quickly. Last, even a fairly small container of these snack mixes will be welcomed---either as part of a larger gift package or in a stocking. Everyone likes to have their “own” snack mix even if they don’t receive a big container. Add these snack mixes to your holiday gift giving and you'll be giving a great homemade gift and making your holiday giving less of a chore! Update: I’ve submitted this post and the two snack mix recipes to this month’s host of Go Ahead Honey, It’s Gluten Free! blog carnival, Carol (Simply … Gluten Free). 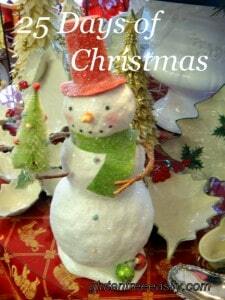 They are perfect for Carol’s theme of Family Traditions. Go Ahead Honey was created by the lovely Naomi of Straight Into Bed Cakefree and Dried. Each month a different blogger hosts with a different theme. It’s a fun event that’s been going on for several years now. I even hosted back in July 2009 with the theme, Go Ahead, Make Me A Happy Camper. You can see that roundup here. Check out all the 25 Days of Christmas posts (to date) below. Some of the giveaways are wrapping up. I extended the Kitchen Table Bakers Cheese Crisps giveaway one more day through midnight tonight; enter here. 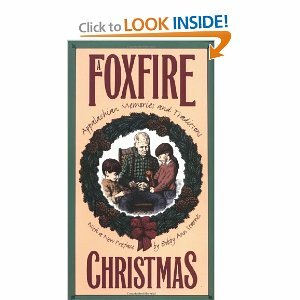 The Gluten-Free Holiday Giveaway Galore x 10 (a great package with children’s book and goodies to try out) also ends at 10:00 pm tonight; don’t miss that. Finally, read my review of Kelly Brozyna’s new cookbook, The Spunky Coconut Grain-Free Baked Goods & Desserts, and enter the giveaway! But, again, if you’ve missed any of the other posts, take a moment to check them out. There are eye-opening and moving personal stories of celiac/gluten intolerance, travel reviews, conference reviews, product reviews, and, of course, recipes! Full disclosure: I was one of the gluten-free bloggers who attended the General Mills Gluten-Free Bloggers Summit in November. Most of my expenses were paid for by General Mills for that trip. However, this post is not a paid article. The opinions expressed here are clearly my own. This post is linked to Gluten-Free Wednesdays, Go Ahead Honey, It’s Gluten Free, and Saturday Night Fever. So tempting, but I am one of those who needs zero gluten. Too bad, because I was one of those who preferred the Chex Mix to the cookies at Christmas. I go for the salty and crunchy over the sweet and gooey anytime. Hoping for safe, salty, crunchy snack mixes for us both in 2011! That’s interesting…I thought GM had dedicated facilities and hopefully they decide to go the extra mile and start testing, too. I’ve heard of similar experiences What was their response to your comments? How sweet of you to make the mix for your family! I have/had those very same tins! LOL! You’ll be at LCBR on Friday—have fun!!!! Love the chex mix! Such a great snack! Esp around the holidays. Hi Kim–No worries, dear … I’m behind on my own series! LOL No need to catch up. Thanks so much for mentioning the Health Valley Crunch’ems. They aren’t sold locally, but I will definitely look for some when I venture further away from home to WF and the like. I’d love to make my snack mixes for our Valentine’s Day party using them. 🙂 Make the sweet and crunchy mix … we love it! 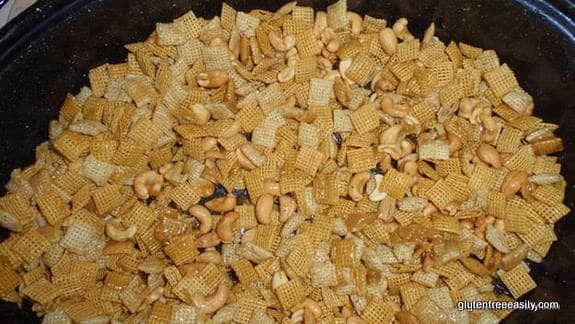 My mom always makes a Chex snack mix, and I know it is something my son misses. I don’t think he’s tried the gf Chex, but based on other reactions, I don’t want to risk it. Like you said, hopefully we’ll be able to eat it in the future. Hi Linda–Did you see Kim’s suggestion to use Health Valley Crunchems? I think we should try those in the snack mixes. As soon as I find some (not sold here locally), I’ll do so and report back. 🙂 Son would love them, too. Trish–I just checked French’s brand of Worcestershire sauce again, too, and it’s still gluten free. So you can use either of those if they are available in your area. I love chex mix but I don’t make it very often cause its so delicious and addicting. But its a very good gift idea if you don’t know what to get for a loved one or friend. Hi Valerie–It looks like you are new here … welcome to gfe! 🙂 Don’t we always reserve delicious and addicting for special occasions like the holidays? 😉 But, you are so right, if one makes it, one will eat it … rapidly. Yes, folks love these snack mixes and they are so much better to give as gifts than highly processed popcorn and the like. Just hit the “print” button! Will make a batch tonight. I would take Chex Mix over most cookies. Thanks for posting this and reminding me to make some! Yum! Another classic from your kitchen Shirley. mmmm, sweet, salty…everything i want in a snack!